At the extreme West of the First (US) Army sector, Sainte-Mere-Eglise was situated between the drop-zones of the US 82nd and 101st Airborne Divisions, and the scene of heavy fighting when some inadvertently landed in the town. One paratrooper even got caught on the churchtower and was wounded, but survived the battle. 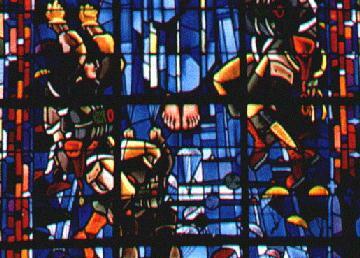 Today, a dummy figure hangs from the tower, while two beautiful stained-glass windows in the church commemorate the Liberation and its 25th anniversary. 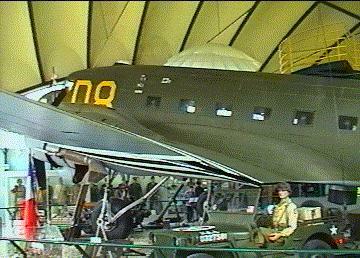 The town is also home to the superb US Airborne Museum, with the first parachute-shaped building containing a complete American Waco glider, while the second more conventional dome houses a Douglas C-47 Dakota aircraft. Many of the exhibits have been donated by D-Day veterans - both Allied and German - adding a very personal dimension to the displays. 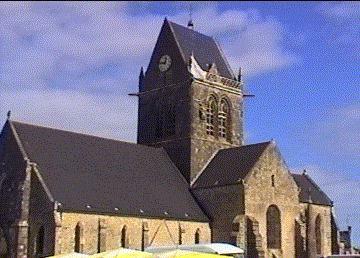 The church at Sainte-Mere-Eglise, complete with dummy paratrooper on the tower. Detail of one of the stained glass windows in the church. This Sherman medium tank outside the Airborne Museum is an intriguing variation. 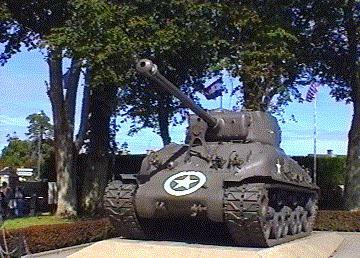 The distinctive HVSS suspension is unqiue to the M4A3E8 ("Easy Eight") model, yet the rounded cast body and turret are of the M4A1 (76mm gun) type. 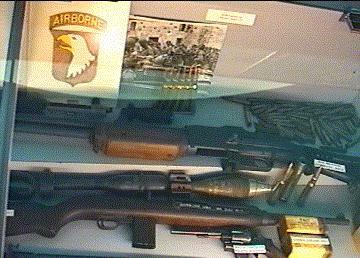 US small-arms and ammunition, including .30" Browning Automatic Rifle (BAR) [top] and .30" M1 Carbine [bottom]. 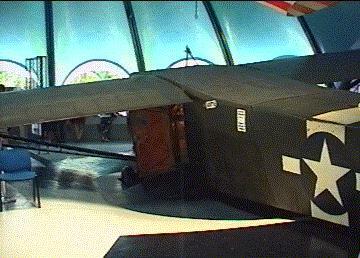 Waco glider in the Airborne Museum. It could typically carry 16 men, or one jeep and 4 men, or one 75-mm howitzer and 3 men. 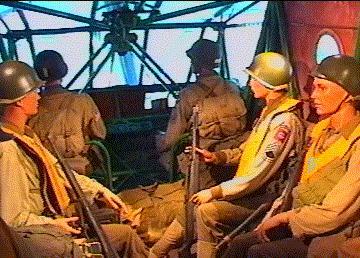 Interior of the Waco glider, showing crew and troop seating. 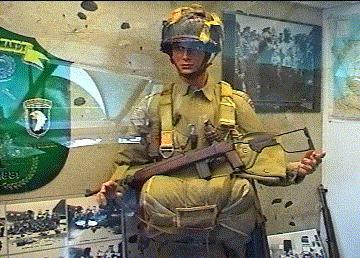 D-Day US paratrooper uniform and kit - note folding-stock M1A1 varient of the M1 carbine [seen above], specially designed for airborne soldiers. 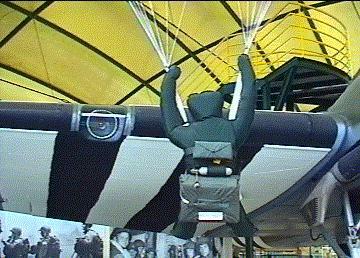 Dummy paratrooper. The small pack contained firecracker-like charges, which simulated gunfire on landing. Thousands of these were dropped across Normandy on the night of the invasion to confuse the Germans. The exhibit was donated by the owner of the company which originally made them for the US Army. Heading towards the coast, purely by chance we stumbled across the German Wehrmacht (Regular Army) battery at Azeville. 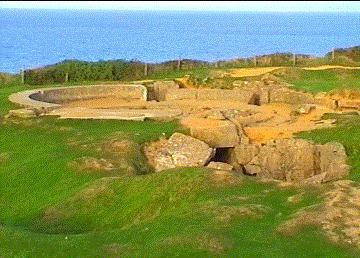 Originally housing four 105mm cannon, it had a range of 6 miles, and was a back-up to the nearby naval battery at Crisbecq. It was taken by the US 22nd Infantry Regiment on 9 June. Although - as in virtually all cases - the guns have long-since been removed, the battery is remarkably well preserved and open to the public, and one can walk all the way through the two casemates. Buried "Tobrukstand" and reinforced communication trench at Azeville. 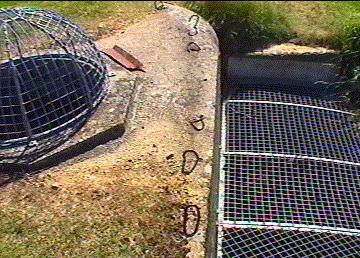 The hooks in the concrete - extensions of the steel reinforcement - were used to secure camouflage netting. Rear of the two casemates. The one on the left is the only one substantially damaged. The structure on the roof is for an anti-aircraft gun mounting. Open gun platform. At the time of the Invasion, not all of the 105mm cannon were in casemates. 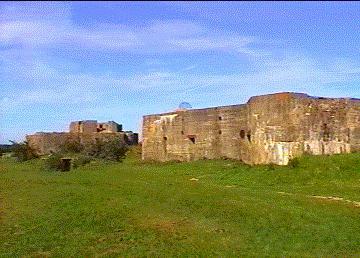 Front view of casemate. 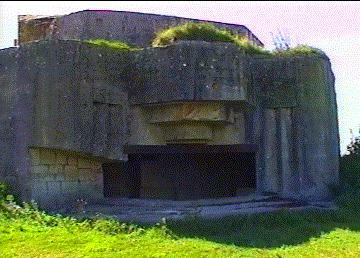 Note concrete approximation of the Todt Front seen at the Audinghen/Audreselles battery. 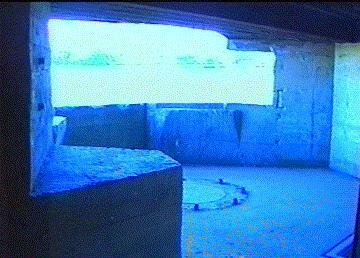 Casemate firing chamber, with remains of gun-mounting. 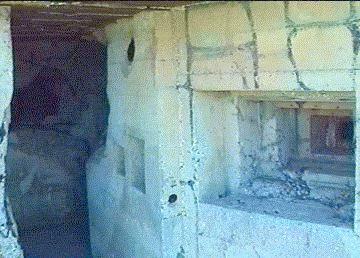 Interior of rear storage area of casemate, with shell-damaged defensive gun-port. 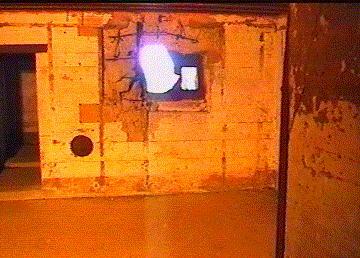 A second port is situated facing down the access corridor to the left, allowing an over-lapping field of fire against attacking troops. 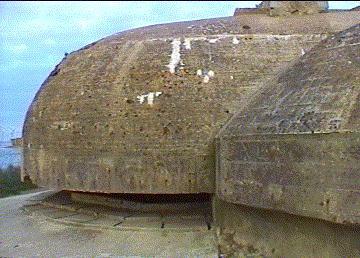 Exterior of casemate entrance, with the shell-damaged gun-port on the left, and the undamaged one on the right. 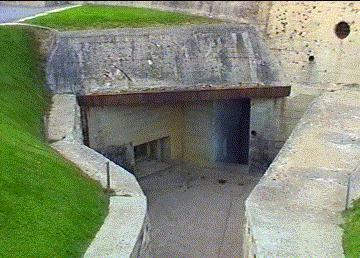 Embrasure of the second - largely undamaged - casemate. At 06:30 on 6 June, the 8th Regimental Combat Team of the US 4th Infantry Division landed at La Madeleine Beach, 1¼ miles South-East of their intended Utah Beach objective due to strong currents. Fortuitously, this area was more lightly defended than the original target, and so was taken with relative ease after a brief fire-fight. Famously, 57 year-old General Theodore Roosevelt, cousin of the US President and walking with a stick, insisted on landing with the first wave of troops, justifying his presence by saying: "It will reassure the boys to know I am with them." Within two months he had died of a heart-attack, and - in contrast to Roosevelt's passionate sense of responsibility - later in the European campaign many American generals would be bitterly criticised for never being anywhere near the frontline troops under their command. To the North-West of Grande Dune, Saint-Martin-de-Vareville should have been the site of Utah Beach. The shoreline is still littered with the remains of German bunkers, demonstrating that had the landing craft been on course, this part of the American assault area may well have been far more difficult than it turned out to be. It was here that General Leclerc and the French 2nd DB (Armoured Division) landed soon after D-Day. Leclerc went on to decisively command his men during the battle for the Falais Pocket, and to serve his country in Algeria and French Indo-China (now Viet-Nam). Monument to General Leclerc, with 2nd DB M8 armoured car at Saint-Martin-de-Vareville. Remnants of heavy fortifications among the Vareville Dunes. 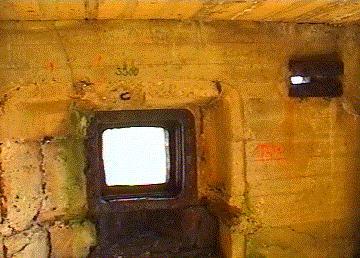 Interior of beach gun emplacement, with large apperture for gun-mounting, and smaller vision-slit. 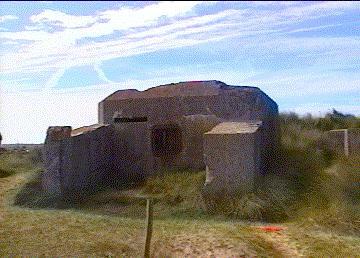 Iles-Saint-Marcouf, 6km off Utah Beach. 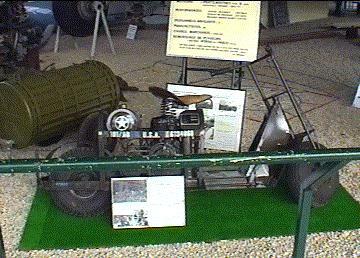 Alligator landing vehicle outside the Landing Museum at La Madeleine. 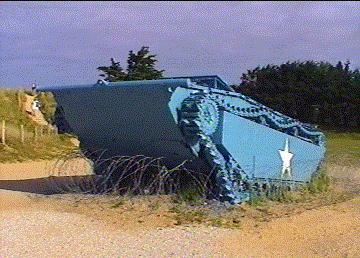 Based on a design developed in the Everglades, they were used experimentally at Utah Beach. 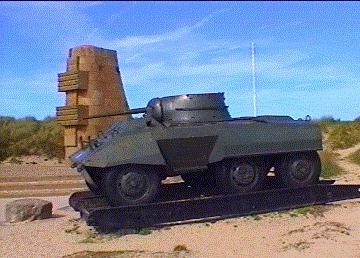 Preserved Landing Craft Assault (LCA) and second Alligator outside the Landing Museum. On the East side of the Carentan Estuary is one of the most poignant of the D-Day sites. 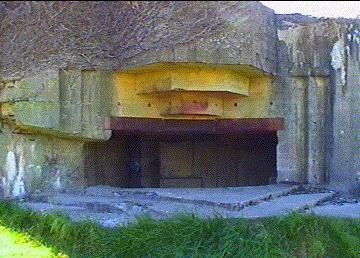 The German Wermacht battery at the Pointe-du-Hoc straddled the two American Beaches, and was capable of shelling either. Heavily bombed by the Royal Air Force and the US Army Air Force, and shelled by Allied warships, the battery was attacked on 6 June by the American 2nd Ranger Batallion, which suffered heavy casualties trying to scale the sheer cliff-face. With their rocket-propelled grappling hook ropes cut, and the failure of fire-fighting turntable ladders (both of these being innovations of the British Admiralty's Department of Miscellaneous Weapons Development), the Rangers had to rely on more orthodox methods. It was 48 hours before the battery was taken on midday 8 June, when it was tragically discovered that the 155mm cannon were not even in place, having been hidden several miles inland and replaced with timber beams to fool Allied photo-reconnaissance! 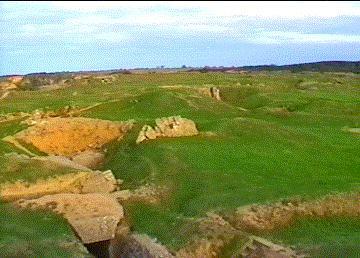 The Pointe-du-Hoc battery today - the bomb craters have been left unfilled, and American and German bodies still lie under the grass. 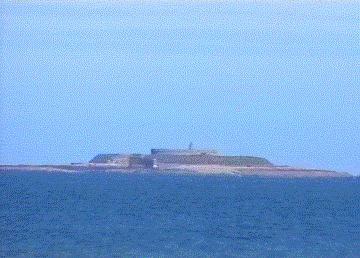 The site is now owned by the US Government and maintained as a Federal Memorial. 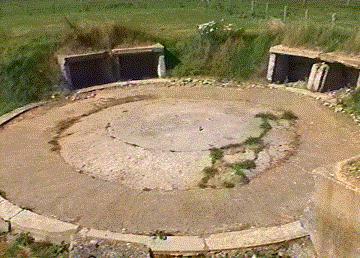 Remains of open gun-emplacement . 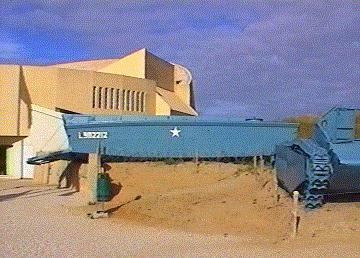 As at Azeville, not all of the guns had a protective casemate at the time of the Invasion. 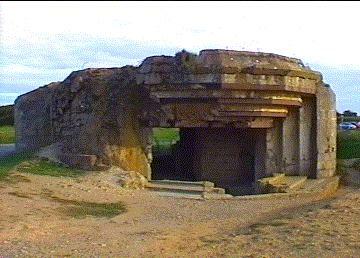 Damaged casemate. Elaborately-defended access trench at the rear of the "Leitstand," or Fire-Command Post (FCP). 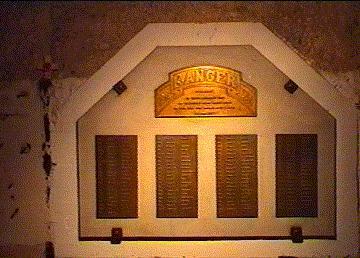 Memorial to the 2nd Ranger Battalion inside the FCP. Front exterior of the FCP.